Reminder to all students: Swimming unit begins for all grades the week of May 11th. Please be sure to bring you swimwear including a pair of goggles and a towel. Grace clears the ball after a great save! 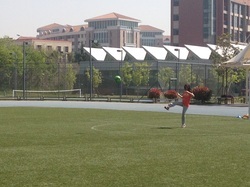 Grade 6 on the field. How have the skills you have learned so far in this unit (dribbling ,stopping, tapping and striking) been useful in game play? Why is spacing so important in the game of soccer? A match is played best 3 of 5 games (or 4/7 or 5/9). For each game, the first player to reach 11 points wins that game, however a game must be won by at least a two point margin.A point is scored after each ball is put into play (not just when the server wins the point as in volleyball). The ball must rest on an open hand palm. Then it must be tossed up at least 6 inches and struck so the ball first bounces on the server's side and then the opponent's side.If the serve is legal except that it touches the net, it is called a let serve. Let serves are not scored and are reserved. 1. Please identify the following items. A)Both base lines B)three point line C) Both sidelines D)Free throw line E)Half court line. 2. Please describe 5 ball handling warm up drills. Example: ball around the right leg. 4. From this position a player is able to pass, shoot and dribble. What it this position called. 6. There are many ways a player can commit a traveling violation. Describe 3 ? 8. How many players are on each team in a full court game of basketball? 9. The ____________ attempts to prevent the opposing team from scoring a basket. 11. What is the best position to guard an opponent? 12. What pass gives the best control and therefore is the most accurate? 15. How many points is a basket worth if shot from inside of the 3 point line? 16. Two technical fouls result in removal from the game. 2.What are two serving violations? 6. In a game there is one person on each team who is allowed to talk to the referee. Who is he/she ? 7. Identify the Bicep, triceps , deltoid, and forearm in the above picture. (draw an arrow pointing to each). 8. Why do you stretch and warm up before exercise? 9. Identify what a deltoids, triceps, bicep, quadriceps, hamstring, and lower back, stretches . Volleyball, like many other team sports, is a game of cooperation and communication. Why is court communication and teamwork necessary to for any good volleyball team. In you responses please identify on court language players need to use. Also speak about one on court (in PE class or at ACAMIS) experience in which team communication and cooperation had a positive outcome. Activity log reflection (week of October 21) : Explain the importance of cooperation and communication in volleyball. Give examples of how you have worked to include cooperation and communication when playing volleyball in class. Short essay make up assignment for missing activity logs. 1. What do you think you most improved upon in this swimming unit? How did you think achieved this improvement? Tell story about your favorite experience in the pool. -USE THE FORM BELOW TO SUBMIT YOUR SHORT ESSAY. -MAKE UP ESSAYS WILL NOT BE ACCEPTED AFTER MIDNIGHT ON OCTOBER 17TH. -PLEASE INCLUDE YOUR FULL NAME AND GRADE. - IF YOU HAVE COMPLETED ALL ACTIVITY LOGS TO DATE YOU MAY USE THIS ESSAY AS AN OPPORTUNITY TO EARN BONUS MARKS. Activity Log reflection prompt : Explain the effects of physical activity on heart rates and recovery rates (take you heart rate before and after vigorous activity). 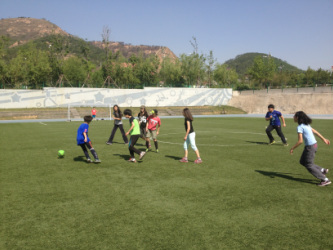 PE classes are designed to give students the opportunity to learn, develop, and strengthen skills and knowledge of various sports and physical activities. We will be exploring different sports and activities throughout the year. Health, fitness, and nutrition will be ongoing topics in several units during the school year. The class includes both activity and lecture sessions. - We will start and end the year with swimming. - Racket sports (table tennis and badminton). - Indoor and Outdoor games. - Health, fitness, and nutrition will be ongoing throughout the year. - Summative and formative assessments: skills and knowledge based assessments based on written, demonstrative, and oral performance. - Instill in students the values and skills of maintaining a healthy lifestyle. - Help students comprehend strategies and rules in playing. - Teach students to work as a team and develop interpersonal skills. - Help students develop good sportsmanship skills and a healthy competitive spirit. Participate to the best of YOUR abilities. Students are expected to bring a change of clothes specifically for PE class. They can wear clothing such as; shorts, t-shirt (long sleeve or short), sweat pants, athletic tights, athletic pants, running shoes or trainers, and socks. Students should then change back into their regular attire after washing (a towel is recommended for this purpose). Students will be expected to perform in skill and knowledge based assessments. YES, this includes quizzes, tests, and homework. Please see above. If a student misses class for any reason at all, they will receive a zero for that day (1% of participation grade). Students can make up a class by doing one of the following activities during any "B" day lunch period; jog around the track, jump rope or participate in an ACTIVE activity. 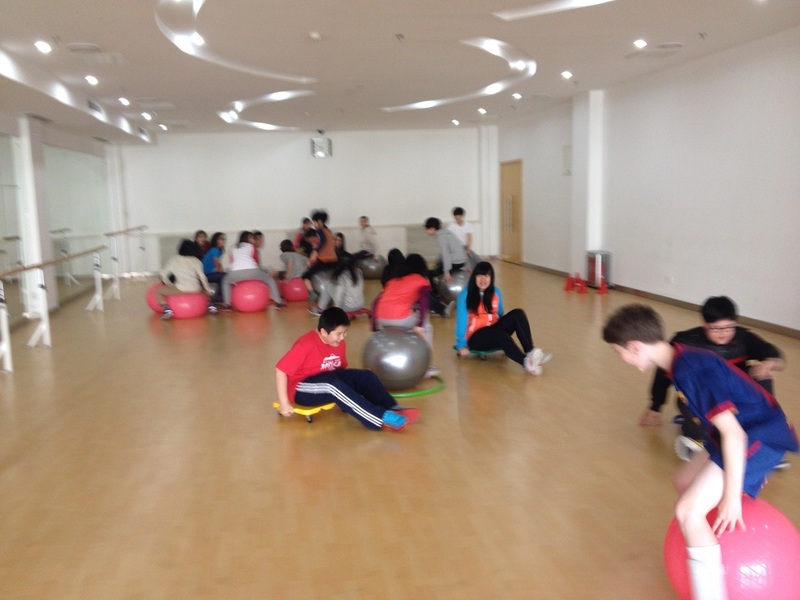 To make up a class students must participate in one of the above mentioned activities for a total of 40 minutes. This can be done over several lunch periods. After a quarter ends, students cannot make up classes from the previous quarter. Additionally, if a student is consistently late the result will be a deduction from the participation portion of their grade at a rate of 1% per three late classes. This cannot be made up. If you are late for a legitimate reason (I.e. you were held back in the previous class) please speak to me at the end of the class and, on a case by case basis, we can account for this in you attendance record.